What you wear can say a lot about who you are and what you believe. In Israel, for instance, the type of kippa – or lack thereof – worn by an Israeli Jewish man often is strongly correlated with his religious identity as well as some political views. These skullcaps (also known by their Yiddish name, yarmulkes), are regularly worn by about one-third of Israel’s Jewish men, especially the religiously observant. They come in several basic styles, with some more favored by particular Jewish subgroups than others. Among Israeli men who say they usually wear a large black fabric kippa, a majority identify as Haredi (also known as ultra-Orthodox) Jews (58%). By contrast, most of those who wear a black crocheted or knitted kippa (59%) say they are Masorti (“traditional”) Jews. And small black fabric kippot (the plural of kippa) as well as colored or patterned crocheted kippot are particularly common among Dati (“religious,” sometimes called “modern Orthodox”) Jews. Meanwhile, among Israeli men who do not usually wear a head covering, 73% are Hiloni (“secular”) Jews, and about a quarter (27%) are Masorti (“traditional”). While wearing a kippa in everyday life is primarily a statement of religious identity, in Israel, certain types of kippot can indirectly be strong clues about some of the wearer’s political views. In fact, the term “kippa sruga” (knitted kippa) is sometimes used to describe “religious Zionists,” observant Jews who see the Jewish people as religiously entitled to territory in the region. The data support such an association. Among men who wear colored or patterned knitted kippot, a majority (63%) say the term “Zionist” describes them very accurately. By contrast, most of those who wear a large black fabric kippa (58%) say the “Zionist” label does not describe them accurately; this group is made up largely of Haredim, some of whom have long been ambivalent about the Jewish state. Majorities of those who wear a colored or patterned knitted or crocheted kippa agree with the statement “Arabs should be expelled or transferred from Israel” (65%) and say peaceful coexistence for Israel and an independent Palestinian state is not possible (58%). Likewise, about seven-in-ten men who wear a black crocheted kippa agree that Arabs should be expelled or transferred, including 45% who strongly agree. And fully three-quarters of those who wear a black crocheted kippa (75%) say a two-state solution is not possible. 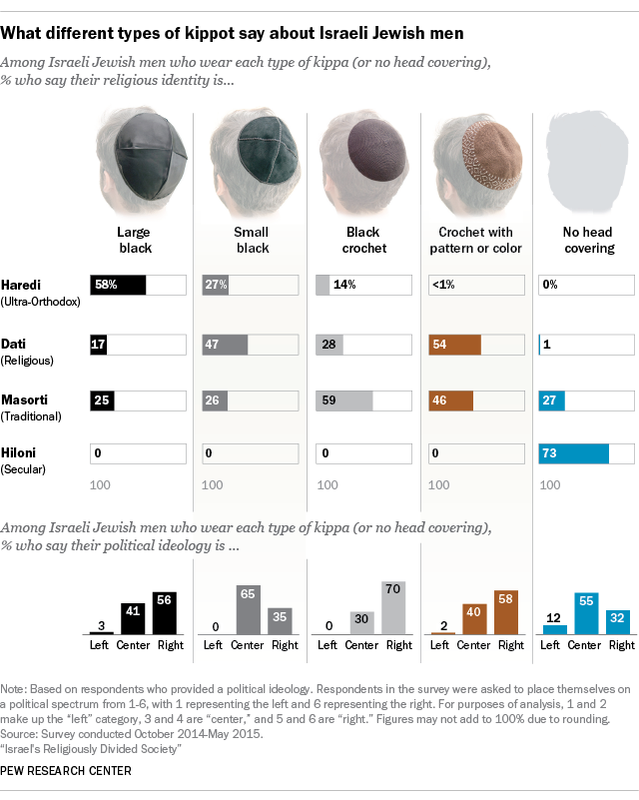 When asked about their political ideology, most Israeli Jewish men who wear a black crocheted kippa (70%) or a colored or patterned crocheted kippa (58%) say they are on the political right. Meanwhile, most Jewish men who wear a small black fabric kippa (65%) identify as political centrists, as do most Israeli Jewish men who do not wear a head covering at all (55%). Among those who do not wear a head covering, 12% describe themselves as being on the political left – still a small minority, but much bigger than the virtually nonexistent share of men who do wear kippot who identify with the left. For a full breakdown of the views of men who wear different types of head coverings on several issues, see the tables in this PDF.